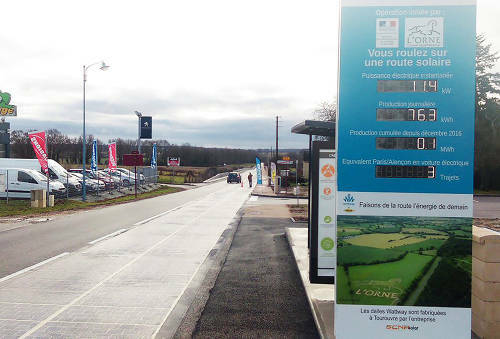 France has recently unveiled the world’s first solar road, the first of the proposed ones. The road runs through the tiny town of Tourouvre-au-Perche in Normandy. Costs are of € 5 million/km, despite the already announced plans to significantly cut production and repair costs compared to conventional roads. Numbers also say that paved roads are occupied just 10% of the time and, taking 20m2 of panels to generate enough electricity to power a home. The panel road must endure two years of trials and testing. During that time, output and lifespan will be the two key components measured as to whether or not the road will become permanent. It must be taken into account that according to a Bloomberg New Energy Finance report, the average price of solar energy in nearly 60 countries fell to $1.65 million USD per megawatt during 2016. This is just below wind energy which is at $1.66 million USD per megawatt. In line with this trial: success of the world's first solar-powered cycle lane.